The Auto Magic Group is a unique South African success story, driven by the desire and passion of a team of entrepreneurs to prove that a business specialising in non-structural (NSR) automotive paint and body repairs could be successful. At the time the concept was thought to be foolhardy in the South African motor body repair (MBR) industry. Services offered include panel replacement and repair as well as dent, chip, scratch and hail damage repair. With dedicated panel beating experts, state of the art panel beating facilities and the very best panel beating tools and equipment available, Auto Magic prides itself on delivering guaranteed results to all clients. Auto Magic has a client base that includes insurance companies, major brokers, private vehicle owners, motor vehicle dealerships, commercial and rental motor vehicle fleets. 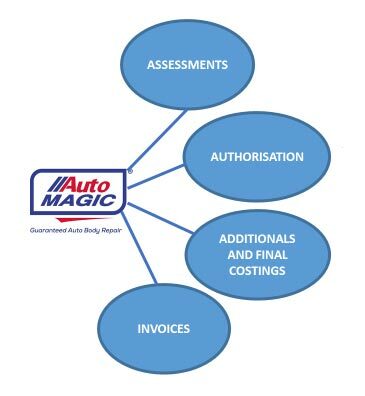 In order to continually provide the best possible service and satisfaction for each client, Auto Magic strives to improve operating techniques and systems and maintains relationships with a number of strategic suppliers. By doing this, Auto Magic holds a unique position within the panel beating industry in South Africa. Having piloted the Auto Magic system for 4 years and following extensive evaluation of the business concept with the assistance of a reputable franchise consultancy, it was decided that the franchise system should be used to expand the network. Tiga online Bordereaux system (glass division) / Call centre – employing around 50 staff at the call centre. The Bluespec Group has recently acquired 50% of Auto Magic. Bluespec is a supplier of end-to-end insurance solutions including vehicle accident management, fleet logistics, integrated assistance services, auto body repairs and salvage solutions. The combined group is uniquely positioned to provide total procurement solutions to major insurers through its partnering approach to cost savings and leakage mitigation. With the joint venture, we are aiming at a total solution for the insurance company; assisting from the occurrence of the accident, to the towing and salvage yard and finally to the panel shop and auction, even extending to car rentals. In other words, this partnership will enable us to offer the insurance industry a much more comprehensive solution. The intention is to list the operations within the next three to five years and Management are confident this will bring a unique opportunity to the investment community.